This pricey dessert is made from frogs' fallopian tubes. To look like a radiant princess, you might need to eat a frog—or more specifically, its reproductive organs. That’s part of the thinking behind hasma, a Chinese delicacy made from the oviducts of the snow frog, a rare species found in the mountains of northern China. Consuming this gelatinous tissue, also called “snow jelly,” is said to be good for the complexion. Some Chinese traditional medicine practitioners also recommend it for ailments such as respiratory issues. Harvesters catch female snow frogs before winter to tap into the nutrients stored for the long hibernation season. Alternatively, there are also frog farms that raise amphibians for this and other medicinal or culinary purposes. Since the snow frog is rare, some businesses are turning to species with healthier populations, such as American bullfrogs, to produce hasma. To make the delicacy, cooks partially dry the frogs and then remove the oviducts (equivalent to the fallopian tubes in mammals). They then soak the dried tissue in water, where it plumps into a bland, white jelly. 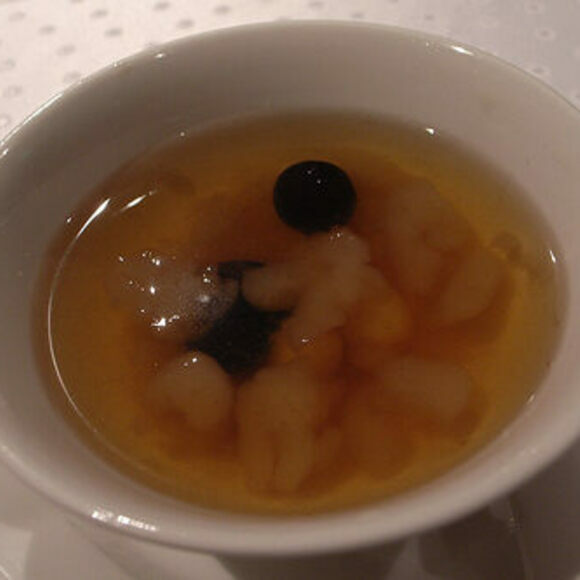 Combined with rock sugar and dried fruit, it becomes a sweet dessert soup. The gelatinous mixture is sometimes served inside a hollowed-out papaya, as seen on The Amazing Race. Supermarkets and herbal shops in your local Chinatown may carry hasma in dried form, ready to be rehydrated in soups, desserts, or drinks. Expect to pay a lot for a tiny packet, though the stuff expands significantly in water. Tours of this frog farm also include a free hasma (here, called hashima) sample, which is made using American bullfrogs. Call or email to book: +65 6791 7229; events@jurongfrogfarm.com.sg.